A couple of years ago I was looking for a way to improve my physical fitness routines with out causing more injuries to my knees, back and ankles. I mountain bike, hike, walk/jog a little, weight train, swim, scuba and play sports (when I can, currently very time limited). Also, as most of my readers and friends know I have also been a martial artist for over 3 decades and wanted footwear I could use in that respect too. I was on a mission to find ‘some kind of performance’ footwear that would enable me to do most of these activities and improve my joint strength and at the same time provide me with comfort. I’ve had numerous surgeries on my lower limbs; knees, ankles etc.. [Actually my whole body – but that is a result of an overly adventurous mindset and fodder for another post(s).] I was looking for some type of footwear that would not aggravate or cause greater pain to my knees, back and ankles. After spending months doing research and loads of reading I found Vibram FiveFingers! They were recommended by runners, hikers, climbers and many other enthusiast magazines and blogs. I looked at the science behind their design concept and production and I was sold. I have been wearing them for a couple years now and absolutely love them! I have worn them all over the Pacific Northwest, in Moab Utah and all though Yosemite. I wear them when ever and where ever I can. "The typical human foot is an anatomical marvel of evolution with 26 bones, 33 joints, 20 muscles, and hundreds of sensory receptors, tendons and ligaments. Like the rest of the body, to keep our feet healthy, they need to be stimulated and exercised. Many experts believe the shoes we wear not only cast the foot in a protective form, but also weaken our foot and leg muscles, leaving them underdeveloped and more prone to injury. And while there are many occasions where traditional footwear is essential for protection, safety, and security, it is equally important to stimulate and exercise the foot in a more natural state on a regular basis." 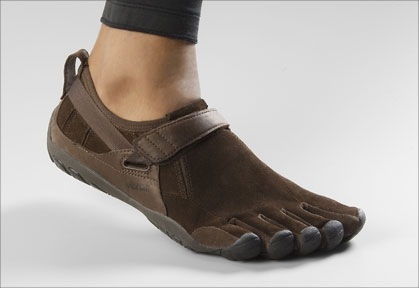 Since FiveFingers are quite unique they often elicit impromptu queries and conversations. If you are in anyway afraid of having people speak to you don’t get these; everywhere you go people will ask you about them. Okay so now some information and details. There are many, many sites with great information about this footwear. I certainly don’t have the time or resources some of these people do. But I am grateful someone spent the time. First place to start is of course the manufacturer’s site linked above and here. Here is a great site by Justin Owings with WAY more stuff than I could put together. Probably the best site I’ve come across with regards to these footwear. I chose the KSO models off the bat because of their very ‘tight’ fit. Meaning I could pivot/rotate and move without coming out of my shoes. Something that has happened even with TKD shoes. I also like the actual ‘keep stuff out’ part. There are loads of loose pebbles and stuff where I walk and hike and few things are as annoying as rocks in your shoes. Check out Justin’s e-book "the beginner’s guide to FiveFingers. This site is loaded with phenomenal information and links about the whole barefoot shoe theory and practices. There are guides here and here. After seeing some of the new designs and seeing a guy skydive with these (Bikila LS) I am most definitely getting a pair of these too. You can find hundreds or even thousands of articles and reviews if you just Bing or Google yourself away. I’ve taken all my previous personal emails and tips about this subject and put them here for you all in the hopes it helps you.